Three examples of the Lee and Turner three-colour process, c. 1901, from D.B. Thomas, The First Colour Motion Pictures (1969). Note the different tonal effects (e.g. the girl’s sash on the left-hand film) for the same image taken through red, green and blue filters. The first patent for colour cinematography was that of the German Hermann Isensee, in 1897, but activity in this field now moved to Britain. There were four names actively pursuing the goal of practical colour cinematography. One was William Friese-Greene, a figure who used to turn up in many film histories as one of the ‘inventors’ of cinema, and whose supposed discovery of motion pictures was romantically dramatised in the film The Magic Box (1951). That complex story can be told at another time. Suffice to say that Friese-Greene did not invent motion pictures (though he and his supporters claimed loudly that he did), and he turned his attention to colour cinematography. He patented a system (British Patent no. 21,649) in 1898 which posited use of a rotating disc with red, green and blue sectors, which echoed Isensee’s ideas but showed little comprehension of how the theory might work in practice. The other inventor was Captain William Norman-Lascelles Davidson, an experimenter in colour photography as well as cinematography, who in the same year patented (B.P. 23,863) a triple-lens camera with three filters (red, green, blue) behind each of the lenses. This was a step nearer in its thinking, though it led to no working model. There will be more on Friese-Greene and Davidson, who would soon be working together, later on in this series. The first recorded suggestion is the British patent of Lee and Turner, two young men who were employed in my workshop in London, and who with my consent patented a scheme which I disclosed to them but which I told them was of more theoretical than practical interest at that time. I considered it a great joke when their patent rights were afterwards sold for real money; but, as I predicted, the method was not practically satisfactory. There is no evidence nor likelihood that Lee worked for Ives, but the latter was in effect right that Turner’s invention owed a lot to his ideas. Turner took a conventional cine camera and had its shutter replaced by a rotating disc with red, green and blue filters, interspersed with opaque sections, in synchronisation with the movement of the film through the camera. 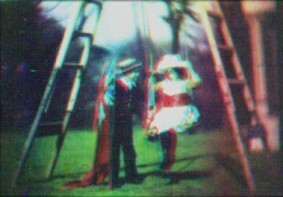 The black-and-white film passing through the camera would therefore record in succession a red, green and blue record. 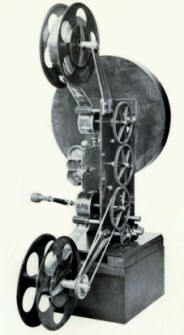 The film was to be shown through a three-lens projector (illustrated above), with each frame projected through each lens in turn, and again a rotating shutter was used to reintroduce the colour. It was when we came to superimpose the pictures on the sheet through three-coloured glasses that we found the process unworkable. As soon as the handle of the projecting machine was worked the three pictures refused to remain in register, and no knowledge that any of us could bring to bear upon the matter could even begin to cure the trouble. The difficulty is mainly due to the fact that cinematograph pictures are small to begin with, and they have to be enormously magnified in exhibiting, as you all know. The slightest defect in registration it pitilessly magnified, and when the minute defects of registration in the first three pictures are followed by minute defects of another sort in the next three, and by yet another sort in the succeeding three, and so on throughout the length of a film, the effect on the observer is almost unbearable. The witness is George Albert Smith (writing in 1908), a Brighton-based filmmaker and film processor, who processed Lee and Turner’s films and who would go on to invent Kinemacolor. How do you bring three successive frames of the same image into synchronisation by such mechanical means? Lee and Turner’s invention seemed only to show that it was impossible – certainly unwatchable. That there was a colour record there that in theory be uncovered is shown by the above simulation, taken from the black-and-white separations illustrated at the top of this post (the two children may be those of G.A. Smith). 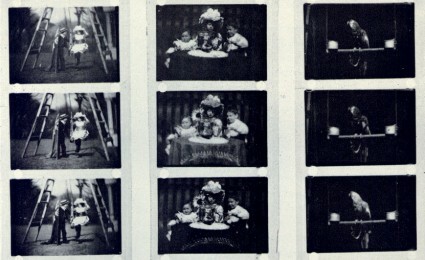 A strip of Lee and Turner film exists in the BFI National Archive, which shows a goldfish in a bowl and then a parrot on perch (see top of this post, right-hand image). But it cannot be projected, and would not work even if it could – it is the oldest motion picture colour film in the world, but we cannot see it. Lee and Turner turned to the Warwick Trading Company to support their work. With the unfortunate results reported above, Warwick and Lee lost interest. However, Warwick’s manaing director, Charles Urban, was not one to give up so easily. 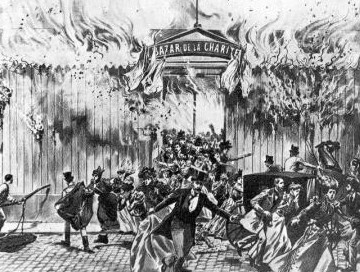 He sunk his own money into the futher development of Turner’s invention, though this hit a problem when Turner dropped dead of a heart attack in his workshop on 9 March 1903. Sadly we still know very little about Turner – there does not seem to be a photograph of him. Urban handed on the problem of making the Turner system work to G.A. Smith, with whom he had worked at Warwick. Could the three-colour records be brought into synchronisation, or was there some other solution?